Alex told me that Randy had arrived into Ashland yesterday and that Randy had checked into the same hotel where Alex was staying. Alex and Randy shared some conversation. Randy had a really hard day of riding, and so he was going to spend today resting in Ashland. Bummer! Randy had tried so hard to catch up with us, and now that he had caught up, we were taking off again! Today's route took us along remote roads. At one point in the ride, we passed aside Medco Lake. 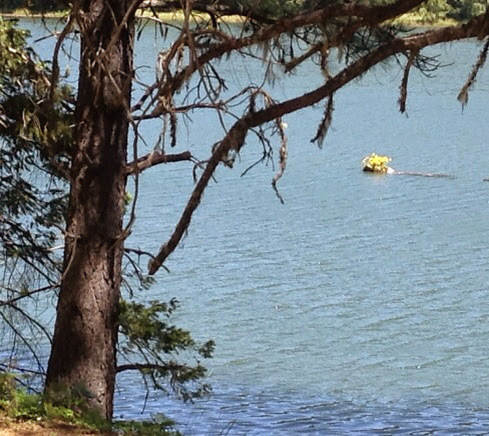 There was a rock in the middle of the lake that was covered with yellow wildflowers. How cute! The wildflower-covered rock in the middle of the lake. The only town we rode through today was Prospect (population 455). 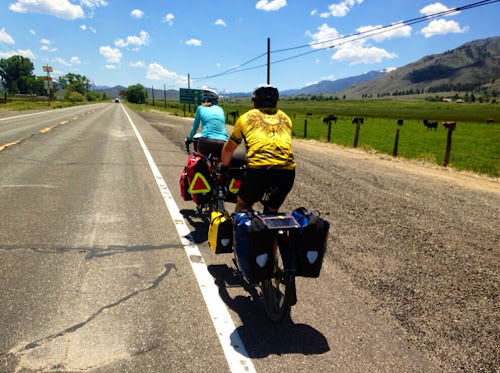 Just before arriving in Prospect, Ferit & Dilek met up with us along the route. Ferit drove by slowly, as Dilek stuck her head out of the sunroof and took photos of us. I can't wait to see the photos! We all met up a few miles later at the River Bridge Campground. The camp was along the Rogue River. Though the river is tame as it runs aside the campground, further to the west, the river offers some of the wildest rafting in the country. We made dinner, went for a walk around the campground, and then we called it a night. We have a picture of you guys riding from the front instead of from the back like most pictures you have. Cool beans. Would love to see it!